Taiwan and the U.S. will hold talks later this year as part of upgraded efforts to counter Beijing's growing pressure on the island for political unification. 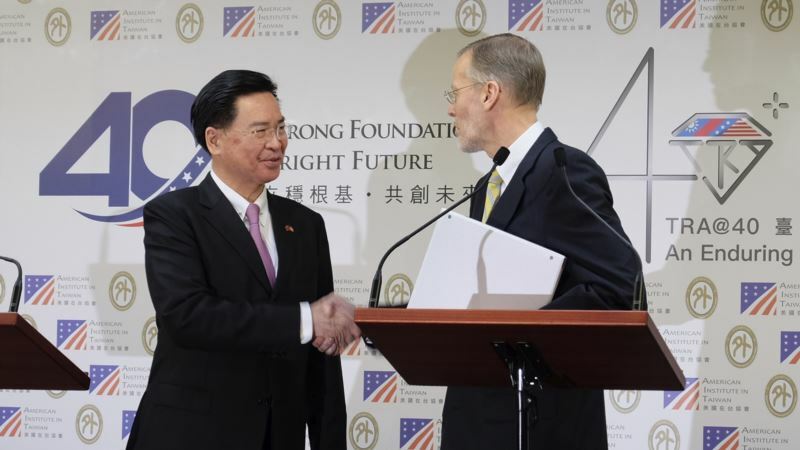 The talks planned for September in Taipei will include a senior official from Washington, de facto U.S. ambassador to Taipei William Brent Christensen said Tuesday. Christensen didn't say whether the consultations are meant to provoke China or push it to make changes. The U.S. has formal diplomatic relations with China but maintains strong ties with Taiwan though the American Institute in Taiwan, its de facto embassy in Taipei, which has recently undergone a major upgrade in facilities. "We believe it's possible to have a good relationship with Taiwan and a good relationship with China at the same time," Christensen said at a news conference. "Things we do with Taiwan should not be regarded as things that we are doing because we are seeking to provoke China or vice versa." President Donald Trump has elevated 40 years of informal ties with Taiwan through more open contacts and planned arms deals. Meanwhile, China and the U.S. are enmeshed in a dispute over trade, copyrights and tariffs, raising economic and political frictions to their highest level in a decade. Taiwanese Foreign Minister Joseph Wu said the "Indo-Pacific Democratic Governance Consultations" as the dialogue is termed would allow the two sides to "grow closer and more direct in their cooperation ... to protect regional freedom and legal order." Taiwan has been democratically ruled for about 30 years. It allows freedom of expression and religion in contrast to China's tight restrictions under authoritarian Communist Party rule, and remains a close U.S. ally in the Asia-Pacific region. While China insists that Taiwan is its territory to be brought under its control by force if necessary, more than 70 percent of Taiwanese oppose China's goal of unification, the government's Mainland Affairs Council spokesman said in January. Many fear Beijing would eliminate Taiwan's democratic institutions. While there was no immediate word from Beijing, China will "most definitely" protest the consultations, said Shane Lee, a political scientist at Chang Jung Christian University in Taiwan. China has used military flybys, aircraft carrier movements and diplomatic pressure as warnings to Taiwan since President Tsai Ing-wen took office there in 2016. Tsai's party embraces greater Taiwanese independence from China, resulting in a strong backlash from China. Beijing has cut all formal ties with Tsai's government, blockaded the island's participation in international forums and persuaded five countries to cut diplomatic ties with it. Washington switched its official recognition from Taiwan to China in 1979. But Taiwan still counts the United States as its staunchest informal ally, particularly as a source of advanced weapons systems. Last year Trump signed a bill encouraging more high-level exchanges between the two governments, inflaming China. In another sign of stronger U.S.-Taiwan ties, Tsai is expected to stop over in U.S. territory once or twice during a trip starting Thursday to visit diplomatic allies in the South Pacific. China has protested to the United States against her previous stopovers.